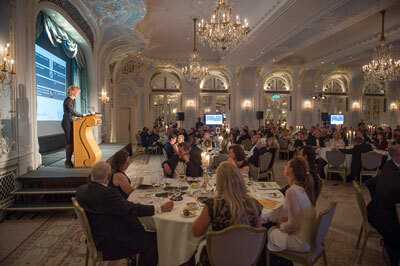 One of the most beautiful ballrooms in London – The Lancaster Room at The Savoy, here hosting a charity dinner for The Urology Foundation. 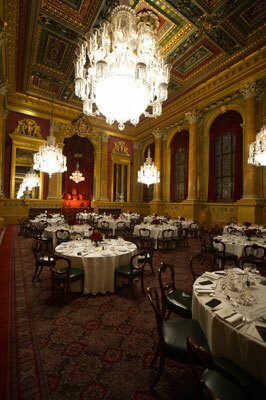 Goldsmiths Hall set for a black tie charity dinner in October 2010. 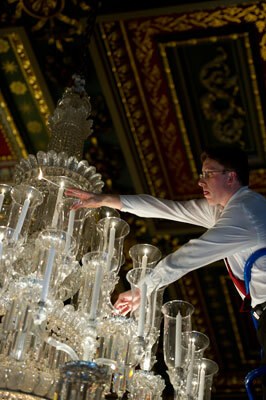 A member of Goldsmiths Hall staff lighting the candles in their beautiful chandeliers which date back to 1835. This is no small matter with 192 candles to light which requires the use of a mini cherry picker and takes close to an hour to complete. 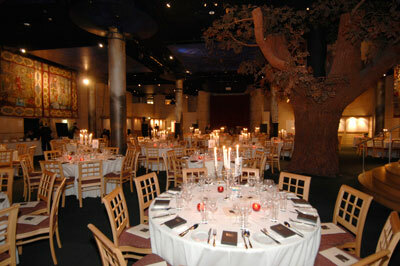 The undercroft at The Globe Theatre in London set for "An Evening with Corin Redgrave" held in aid of The British Urology Foundation (now The Urology Foundation). 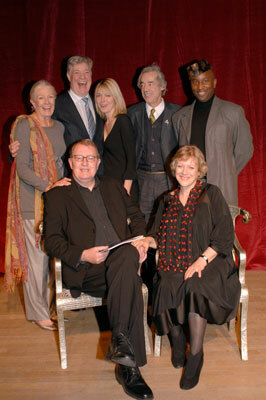 The illustrious "cast" for "An Evening with Corin Redgrave" which was held in aid of The British Urology Foundation in 2007. The audience was treated to 7 readings from our seven guests based aptly, as we were at The Globe, on The Seven Ages of Man. 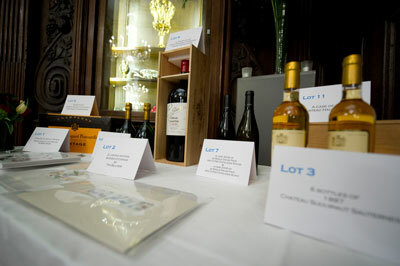 Some of the auction lots for a wine themed auction, part of a charity Wine Tasting Dinner with Jane MacQuitty at Vintners' Halls. Jane MacQuitty is wine correspondent for The Times and has kindly been guest speaker as three such dinners in aid of The Urology Foundation. She is an amusing and engaging speaker and this is always a popular event in the charity's calendar. 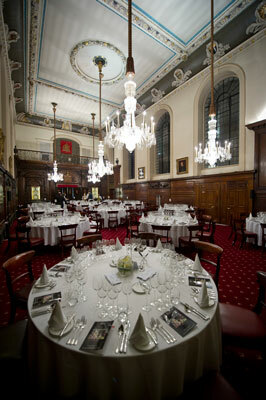 Vintners' Hall set for a wine tasting dinner with, as you can see, the final checks being made by some of their very professional Events team who I have had the pleasure of working with three times now. A case of art illustrating life this time. The Van Haeften Gallery, who specialise in Dutch and Flemish Old Master paintings, kindly hosted a charity champagne reception for The Urology Foundation and the host was amused to find the perfect painting to illustrate the invitation. This painting by Pieter Brueghal The Younger and is an illustration of a proverb, something that was popular during the 16th and 17th century. I am proud to have been associated with The Urology Foundation (formally The British Urology Foundation) since 2004 and to have worked as their Events Manager on many events during that time. You can find more out about the charity at www.theurologyfoundation.org. The calm before the storm. 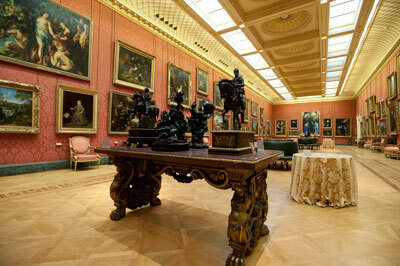 The Great Gallery at The Wallace Collection set with occasion tables in readiness for a private champagne reception. The Wallace Collection is only one of many amazing venues in London that are available for private hire; so if you are looking for a venue with a difference please contact us to discuss your requirements. First rule of organising a Christmas Party, private or corporate, is to book your venue well in advance, key dates always sell very quickly. We can help you source your entertainment for your event whether you are looking for a band, celebrity speakers magician or caricaturist. Please contact us to discuss your requirements. 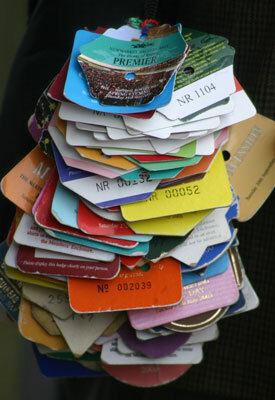 Looking for someone to organise your corporate race day? We can help. Contact us. 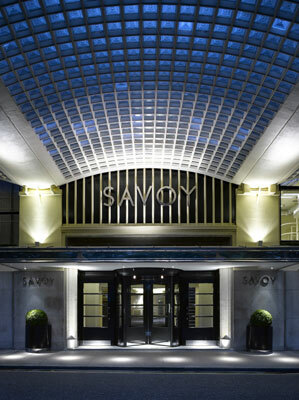 We are looking forward to working at The Savoy again this October for The Urology Foundation Charity Gala Dinner. Work as well as play. 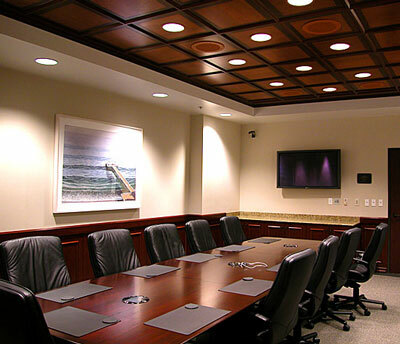 NotNoTrouble is pleased to work with clients on their meetings whether it be a day board meeting for 12 or a large residential conference. We offer a one-stop shop for managing and co-ordinating your meeting from initial planning, budgeting, sourcing venues and suppliers, arranging printing, undertaking delegate management, on site management and post event evaluation. 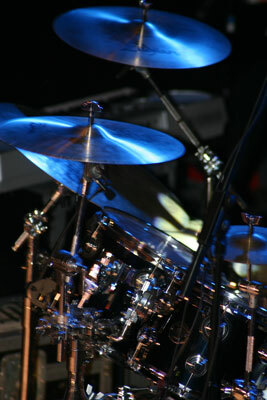 Alternatively we can work with your team on a given element of your event.